Apparatus to demonstrate the physics theory and principles of fluid mechanics problems and dynamic surge pressures under changing wellbore conditions. ■ General Oilfield Awareness Training: Controlling and monitoring dynamic fluid parameters or characteristics is a major part of most key oilfield activities – from drilling to production and intervention, the response of fluids in changing conditions determines equipment specification, process management and procedure preparation. ■ Well Control Training: Understanding how fluid and pressure response must be monitored and controlled to maintain effective well control lies at the heart of all well control activities. Familiarity with the basic principles is key to building towards an understanding of more complex well control concepts and applications. ■ Design and application support: Use our design and support service to modify or customise a GMT apparatus to reflect your specific conditions. For example, a circulation string and positive displacement pump can be added to enable the effects of wellbore circulation to be demonstrated. 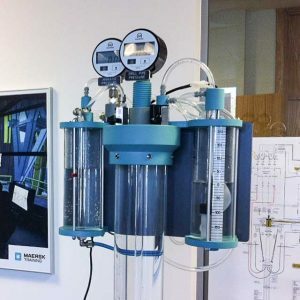 ■ Complimentary systems: Marketec can provide a range of generic models, props and support tools – as well as a custom design and manufacturing service to support and compliment fluid behaviour demonstrations. For example, various designs of fluid filled apparatus designed for use on a magnetic whiteboard can be used to demonstrate the effect of hydraulic communication and the impact of depth – with the added advantage of a dry-erase surface for illustration. magnetic whiteboard delivery. Understanding fluid dynamics characteristics and behaviour of different fluid phases, especially the behaviour of gas and liquid, in a wellbore is a key factor in well control training. If these basic principles are not understood, it becomes increasingly difficult to grasp the more complex aspects of well control techniques and practices. This is critical in recognising the signs of a developing well control situation – and defining an appropriate response. 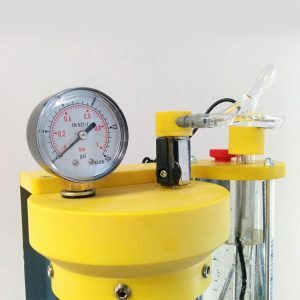 The Gas Migration Tube (GMT) apparatus demonstrates the volume and pressure responses as a gas bubble is transported in a fluid column. Seeing these changes first-hand provides powerful reinforcement of gas behaviour theory … and the ability to understand the effects in both closed and open systems reinforces the importance of correct well control responses. 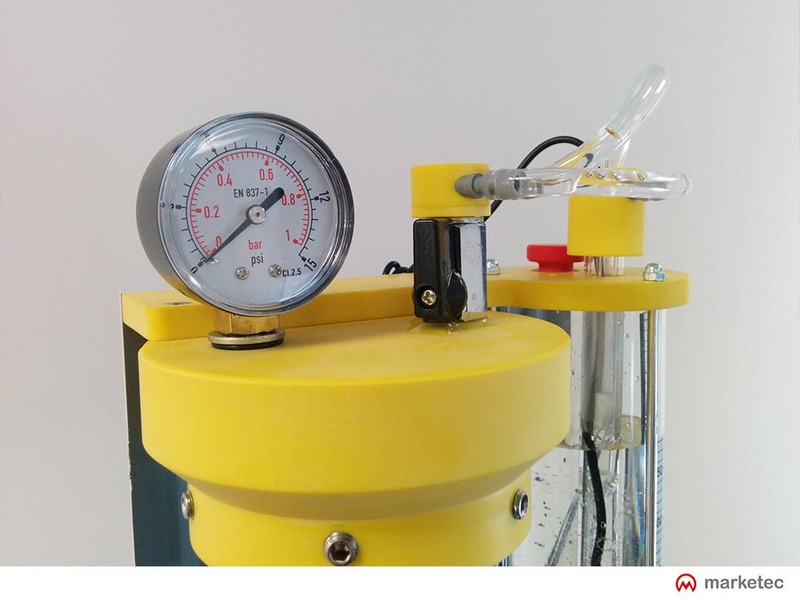 ■ Fluid column and bubble carrier: The position and movement of the gas bubble through the fluid column is controlled via the external ring which is magnetically coupled to the bubble carrier. ■ Press gauges: The GMT pressure gauges are positioned to reflect bottom-hole, casing shoe and wellhead pressures. While the fluid column height (nominally 6ft) induces modest pressure responses, it is the demonstration and observation of pressure trends that supports learning objectives. ■ Trip tank and circulation pump: The circulation pump operates continuously to ensure constant “hole full” conditions, while the graduated trip tank enables changes in volume to be demonstrated. Advanced versions of the gas migration tube model are equipped with an inner circulation string, a positive displacement pump with mud pit, and a circulating manifold and choke system to simulate well circulation. The pressure and volume changes observed during operation of these models provides clarification and understanding of crucial well control principles. Gas Migration Tube The Gas Migration Tube model series supports well control and downhole hydraulics training for the oil and Read more. Maersk Training – GMT Maersk Training Aberdeen are proud to be utilising innovative hands on training tools and methods. They Read more.